I grew up in San Antonio. To us, the Riverwalk area was a nice place to take out of town visitors, and as I grew older, a fun place to hang out during the All-State Convention. By my young rationale, simply due to location, the food on the River was majestic, high brow, and unarguably upper-class. Now that I am an adult, I have quickly learned that a fancy location does not mean fancy food. 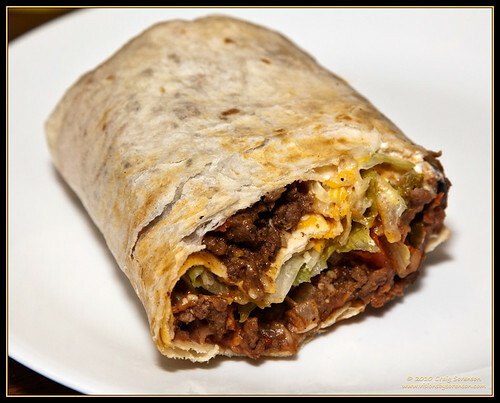 The Burrito Gigante is a humongous dish. It is a flour tortilla practically stuffed with an entire tex-mex buffet, smothered in a curious chile sauce. It is a harbinger of future heartburn, a muddled mix of tastes, textures, and aromas, and, as its name states explicitly, too large for the average person to eat. I have been better pleased eating a Taco Bell 7-layer Burrito drenched in Fire hot sauce. Now, had I paid the same price for this smorgasbord of mediocrity as I might at my local tex-mex eatery, I would not be sitting here typing this out. But, with a couple of drinks, two burritos, and an appetizer (which was the best thing about the entire meal), I spent as much as I might for delightful dinner date at a decent steak place. It might be the ambiance of the place that helps drive the price upwards. Nope. I felt like I was dining in the back end of a mess hall occasionally used for storage. Then maybe it was because of the high quality service. Again, no. Service was not poor, but I did not feel well taken care of. Or maybe it was the claim that this kitchen served only the the most authentic of foods, after all, it was the Original Mexican Restaurant. Again, and this time in Spanish - no. Ok, ok. It must be the River then. In fact, I am sure the location is the only, the ONLY reason for the prices. But does that explain the low quality meal? Does the NY Phil phone it in just because they are in one of the most culturally vibrant cities in the world? Does the Louvre hang bad art on its wall - they have the location, why do they need quality? Do the Los Angeles Lakers only strive for a .500 winning percentage - oh, oops, this one is true. Just because you have the draw and you know people will show up to eat, doesn’t mean you have to sacrifice quality. I can stomach the price if the food is right, but not when you can’t really even stomach the food.